When did you start riding and what made you start? I started when I was 12. So that would be something like 2003 or 2004. I saw two guys riding flatland near my house, and I just watched them riding for weeks, after some time I welded pegs on a 16 “ girls bike and started riding flatland. 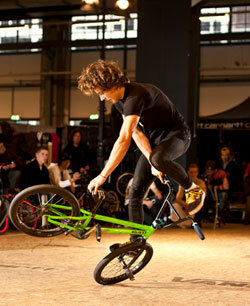 I just fell in love with flatland and I feel exactly the same until this day. What’s your riding style? Maybe short and hard combos, there’s also a lot of street influence, like whips and decades. Any big influences? Progression, there’s no other feeling like when you pull a new trick. Also events and meeting other riders just riding with different people around the world inspires me the most. What’s your killer move? Opposite pedal hang five jump to steamroller and brakeless cliffhanger bar turn. Also one footed whopper. How’s the flatland environment in your country? There used to be around 10 riders, but now there’s only about 4 riders still active. There are some new faces here, that I hope will pick up flatland more. What was the highlight of your career? Riding for Jungle Rider. As for contests, earning 11th place in BMX Masters and 4th in Groudtactics. What is Red Bull Circle of Balance to you? It is the biggest event for flatland and I’ve been watching it for years. Words cannot describe how happy I am to be a part of it now, it’s definitely an event that people talk about long after.